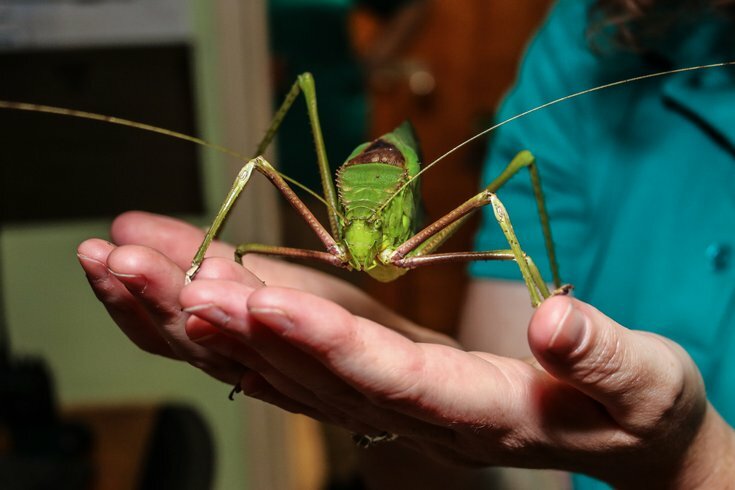 This Giant Katydid is as large as an adult’s hand. Lean its important role in the ecosystem at Bug Fest. Looking for something to do with kids this summer? Bug Fest at the Academy of Natural Sciences will take place Saturday, Aug. 11, and Sunday, Aug. 12. On both days, museum visitors will get to examine live bugs up-close. Check out millipedes, centipedes, scorpions, cockroaches, stick insects, caterpillars, tarantulas, beetles, ants and butterflies. There will be more than 100 species of live insects on display. Museum staff will be on-hand to answer questions about the different creepy-crawlies. Visitors also can join Academy entomologists on an expedition outside the museum to see what species of bugs live there. Other activities at Bug Fest include roach races, a demonstration with a bedbug-sniffing dog, face painting and a bug tasting. Philadelphia candy maker Shane Confectionery will demonstrate how to make a treat packed with healthy, edible bugs. Bug Fest visitors also will want to make time for the new exhibit "Xtreme Bugs." On display are 20 massive, moving, mechanical insects. The special events are free with museum admission. "Xtreme Bugs" is an additional fee.